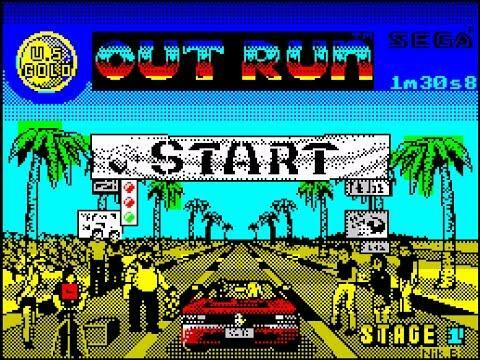 Created by Yu Suzuki, as far as driving games in the 80s were concerned, this was a 3D masterpiece! 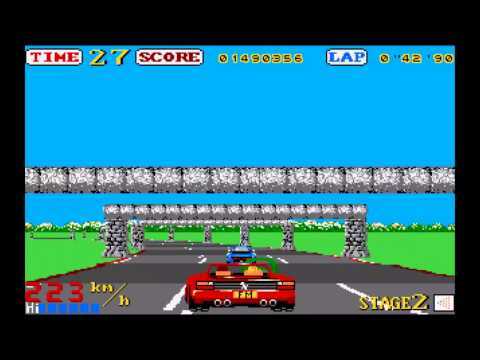 Of course, it looks pretty awful now, but back in the 80s this was the first racing game to feature hills. 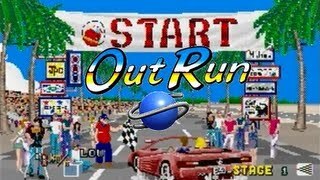 The game also used the sprite-scaling techniques used in Space Harrier. Believe me, at the time this game looked awesome! What I really liked about the game were the luxurious landscapes. A generous dose of palm trees and sand dunes always make you feel alive, especially if you live in Great Britain. In the video above, you can view the Commodore 64 version. 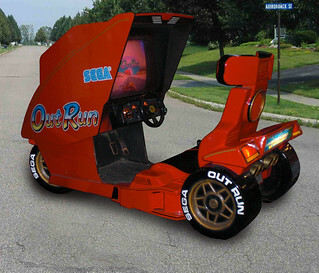 The original OutRun game (the sega arcade version) was the first arcade game ever to allow the player to choose the background music. 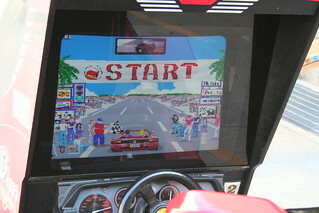 As with the home computer versions, it featured a man and his girlfriend driving a Ferrari. 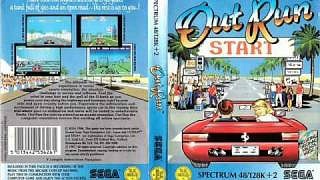 It was first ported to the Sega Master System in 1987, quickly followed by the C64, Amstrad CPC, ZX Spectrum and MSX. In 1988 the Amiga version was released and in 1989 the Atari ST and PC Dos versions were released. This screen grab is from Stage 2 on the Atari ST version. Sadly, this wasn't the best of conversions, and I remember getting bored pretty quickly with the game. 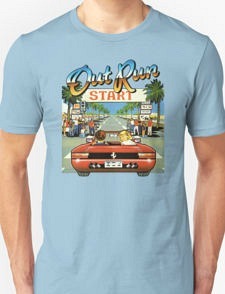 Personally, I actually preferred the 8-bit Atari driving games such as Pole Position. Even though the graphics were very basic, the gameplay was just more exciting, somehow. Well, these are nice, bright graphics, although they look soulless compared to the C64 version. What awful, irritating music, though - much prefer the 8-bit C64 version myself. However, for some home computers an extra cassette of music from the original arcade version was included with the actual game due to limited soundchip capabilities, and I just hope it was included for the PC. Of course, this Sega arcade version looks the most impressive, and this video clip features the uploader completing the game. I like his driving style which is very much like the way I drive (in arcade games, not in reality!) forget the brakes and just skid round the bends! This version is painfully slow, and with the video running for over 11 minutes, it will take a more patient man than me to sit through the whole clip! The Speccy just wasn't made for this type of game and it should never have been released for the machine. On a more positive note, the music is pretty decent, although it is from the 128k version with the Yamaha soundchip (the 48k Spectrum didn't have a dedicated sound chip, just a built-in beeper) and sounds very similar to that of the Atari ST conversion which I used to play back in the day.